Were you one of the people who had your case of insomina cured by watching Ang Lee’s Hulk picture? While Australian hunk Eric Bana was prolly fun for the girls to ogle... the picture had me and my friends snoring. When Marvel Entertainment realized that fans were not interested in a psychoanalysis of the Hulk’s inner feelings... they tried again with the Edward Norton, Liv Tyler picture that was a lot closer to the true origins of Marvel's mean green hero. Reportedly, that film did not perform as desired and then there was the falling out with Ed Norton... details of which we still don’t fully comprehend. 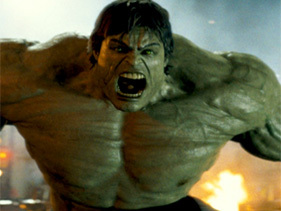 Hulk will reportedly return in the planned 2012 film The Avengers to be brought to us by Joss Wheadon. That film will have Mark Ruffalo portray Bruce Banner... the third actor to portray our Jekyll and Hyde protagoist in so many motion pictures. According to TV Squad, Marvel is in talks to have the Hulk return to television... as the 1970’s version starring Bill Bixby and Lou Ferrigno had a five-season run with some TV movie coverage as well. Check out MTV News for more on that front. Meanwhile, we also need to take note of another superhero who never got an opportunity to make three films with three different actors. Not to be outdone by Marvel, DC Comics are planning to reboot the Wonder Woman television series that made Lynda Carter a household name. For a while, it was thought that Beyoncé might take on that role. Won’t be the first time a superhero changes color. Remember Samuel L. Jackson stepping into S.H.I.E.L.D. in the Iron Man movie? Check out more on Wonder Woman at The CNN Entertainment Blog.